The development of both elite, high performance sport and mass participation, grassroots-level sport are central concerns for governments and sports governing bodies. 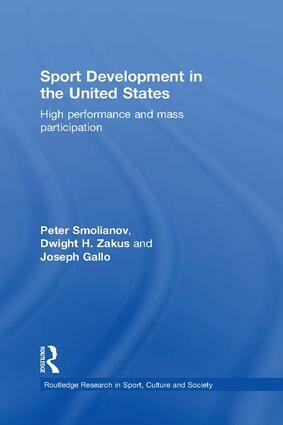 This important new study is the first to closely examine the challenges and opportunities for sports development in the United States, a global sporting giant with a unique, market-driven sporting landscape. Presenting an innovative model of integrated sports development, the book explores the inter-relationship between elite and mass sport across history, drawing on comparative international examples from Australia to the former USSR and Eastern bloc countries. At the heart of the book is an in-depth empirical study of three (traditional and emerging) sports in the US – tennis, soccer and rugby – that offer important lessons on the development of elite sport, methods for increasing participation, and the establishment of new sports in new markets. No other book has attempted to model sports development in the United States in such depth before. Therefore this should be essential reading for all students, researchers, administrators or policy-makers with an interest in sports development, sports management, sports policy, or comparative, international sport studies.